I've chosen the PB-3 Praha due to its nice look. 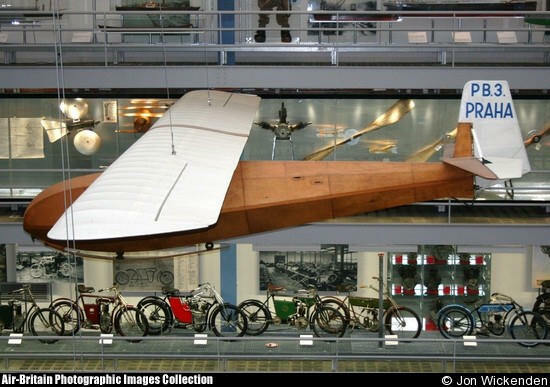 If I'm not wrong only one PB-3 was built, and it is permanently exposed in the Transportation Hall of the Praha Narodni Technicke Muzeum (National Technical Museum). 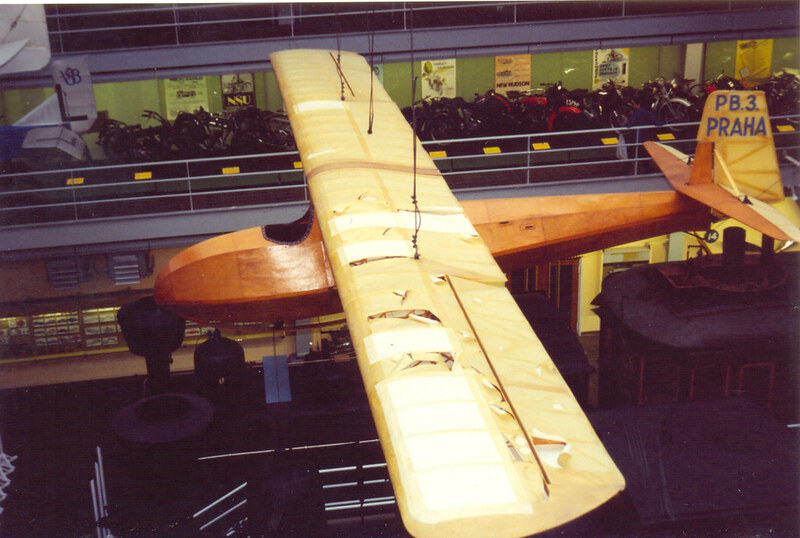 The sailplane was completely restored (only for display) in 2005 during the renovation of the museum. I've found not really much in the Internet about the real machine: a video that documents the moment the glider was taken away to be restored, an article about it and some pictures of the Praha. I'm designing it in 1:4 scale to stay within the 3 meters wing span compatible with my small car. 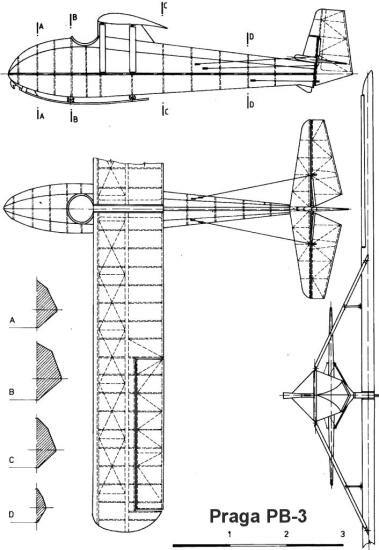 The page of the Czech review Modelar (1990) with the story of the glider. The three view is the main problem... it seems not to be really well drawn... The shape of the nose isn't correct, the wing tips are wrong, the wing profile (I'll obviously change it in the model) is not the same used in the real thing and the elevator has a wrong thikness of the profile if compared to the pictures. The incidence of the stab in the drawing, if compared to the wing, is not that strange... but there is something wrong if you compare it with the pictures. I'm considering also that the real glider may had a "tail up attitude" as usual in a lot of vintage sailplanes. Another thing is the landing skid: at the time of the building were used three dampers instead of the two you can see in the profile view. You can see it in the pics on the page of Modelar. 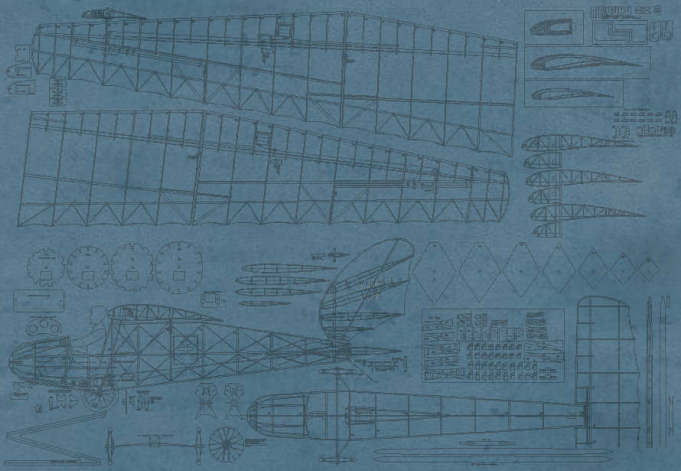 I would like to know if there is anyone who has a good photo set of the PB-3 to have the opportunity to make the modification needed to the three view drawing and proceed with the designing process. It would be nice to have some pics of the cockpit area. I've seen the model of Stanislav Šimeček, probably he could be helpful for the informations I need. Thank you VincentB, it would be really nice if you send me those pics and the alternate views. You should have my email, if you've not I'll send you a request using yours. Something tells me my Czech is the worst ever... maybe I can use a translator. After a "fast look" to the three view drawing published in the book you own I think that I'll do a "mix"... The profile of the fuselage is better described in the one you sent me but the empennage and the wing are better drawn on the one I found on the net. Hope to find infos from Mr Šimeček, maybe some pictures. I'm here to thank Stan Šimeček who sent me recently a lot of pictures of his Praha. Google translator works ... even from Italian to Czech. I am not sure if anyone is still reading this thread but I am very much interested in this aircraft and am planing to build a couple of models in a minimum of two scales. 1/12 and 1/6.